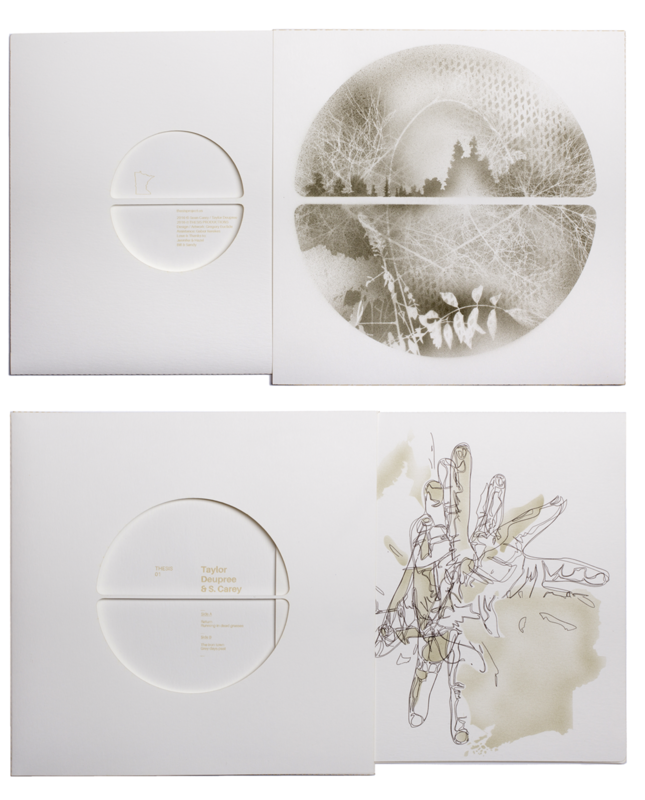 In a way of paying homage to the effort artists put into their work, only to be consumed in an uncommitted manner, Gregory Euclide created the Thesis Project – a way for musicians to collaborate, either with each other or with a visual artist, always with a 10” vinyl with uniquely handmade packaging as a result. Gregory himself is an artist and a teacher based in the Minnesota River Valley, with works of art that all dip heavily into the inspirational well of the land, resulting in stunning depictions of the landscapes he has experienced. Alongside this affection for nature, music is a strong influence to Gregory’s life as well, and though he tried to be a musician for a while, he realized he needed to make a choice between the two art forms, and decided to pursue the career of the visual artist – a decision that proved fruitful, as Gregory’s work has been published and featured on several high-end platforms, and rightly celebrated. What can you tell me about the Thesis Project? How did the idea first come to life? Fast-forward 5 years or so from that night at the concert, I'm on twitter and I read Taylor Deupree (owner of 12k) tweeting something about a wonderful moment from a Great Lake Swimmers performance. It dawned on me that a lot of this music is coming from the same place. GLS make music about the land... Taylor Deupree is largely influenced by the land. Yet, the way they go about expressing it is unique. I wondered if I could bring some of those connections together to widen the musicians understanding and to bring something new to the listener. I got the idea to ask Taylor to do a project with S. Carey of Bon Iver. They both frequently post photographs of the land on their Instagram feed. I could see a nexus between their forces. They agreed to it, and that was the start. Could you describe the process of the project? 1) The first step is to contact the musicians that I think might work well in a THESIS environment. They then decide how they would like to go about the collaboration. Some work together in the same space and some work at a distance. 2) Once the rough mixes are turned in the musicians receive their first payment. I honestly have no idea how other record labels function, but I wanted to pay the musicians upfront regardless of sales and before sales. 3) The tracks then get mastered and sent back to the musicians for approval. After approval, test pressings. After approval of those, we wait. That is when I start creating the jackets and sleeves. 4) Each jacket and sleeve is laser cut, glued and folded in house. Each jacket gets a unique cover that is a combination of air brushed stencils, laser cut paper and type set embossment. Each one takes over 2 hours to make. 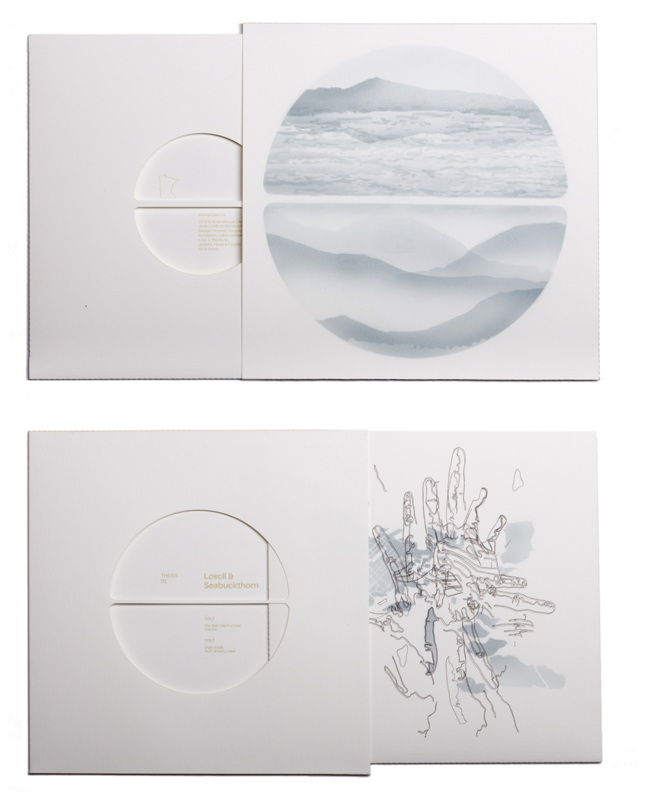 Sleeve Graphic: Each artist involved sends me a photo of their hand. From the photo I do a contour line drawing which gets used on the sleeve along with a depiction of the musician’s place of origin. The line drawing is drawn on the sleeve and the land is air brushed. Jacket Graphic: This is more of a personal response to the music. I pick a few images or shapes that come to me while listening to the music and use those in a modular way to generate the unique images. These change over time, as I am making 300 for each release. It is an evolving image based on experience and time with the material and subject. Has the project changed in any significant way from its early stages? We have been collecting customer data through our online survey since the first set of releases. We use that information to improve the project. We want it to be the best it can possibly be. For example: We switched from white to black vinyl. Some people like colored vinyl, myself included, but black gives you the best possible sound… So, we made a choice to switch in the interest of bringing the best possible product to market. We are continuously improving. You’ve spoken about ‘showing respect’ to the music and the arts – could you elaborate on that for me? By hand-making a unique object for everyone who purchases the work, I am saying "I care." I am also taking a large portion of my time and devoting it to the production of the object. Respect through effort. THESIS is a direct response to the idea that Art should conform to our self-imposed busyness or be under our control or be easy. The care that is required of an object and the relationship that an object has to the body is of interest to us. Learn more about THESIS and purchase their unique, beautiful projects on their website.